I started working part time at Ulta as a Prestige Beauty Advisor around the same time I started my new logistics job. At the time my acne was not bad but I learned a wealth of information about skincare and what I was doing wrong (not using moisturizer, not washing my face every day, using too-abrasive soaps on my face, etc) Granted, I know a lot of it was just marketing techniques to push people to favor certain brands, but there had to be some truth to it! Before working at Ulta I had never heard of the brands of skincare that Ulta refers to as "prestige" (you have your drugstore brands, and then you have the "prestige" section). During the weekly Sunday trainings we would get to try whatever product we were learning about, and oftentimes went home with a sample (this is how I became addicted to Urban Decay eyeshadows as well). Some of these products I thought were all hype, and I was extremely surprised to go home and find that a lot of them worked and were worth the higher price tag. 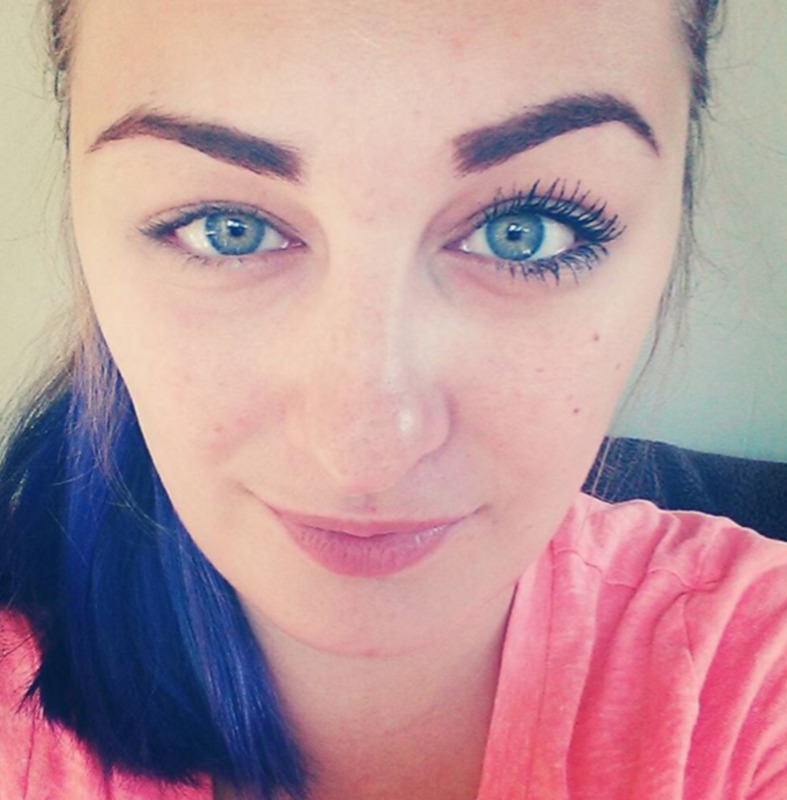 Case in point: IT Cosmetic's Hello Lashes Mascara, whose formula helps eyelashes grow longer and keeps them from falling out as quickly so you end up with three times the lashes than you would normally have. 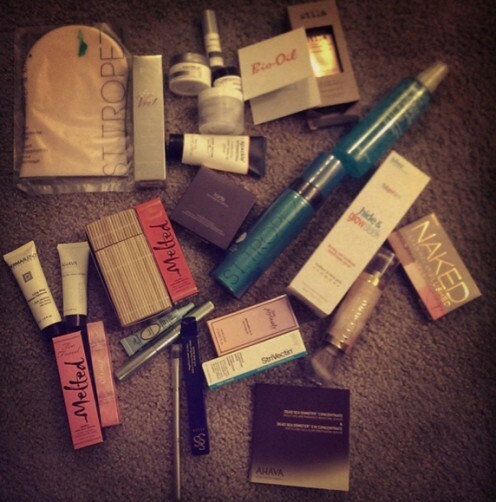 I gained some trust in more expensive brands through my Ulta training --- so when my acne got REALLY bad over the summer of 2015, I started trying various products, both drugstore and prestige. I bought a Clarisonic Mia 1, a facial cleansing brush, which definitely helped but didn't completely eliminate my acne. By November 2015 the acne on my chin was horrible. I had huge spots all over my cheeks, and I was having a lot of trouble covering them up. I had heard great things about Murad, and LOVED their T-Zone Pore Refining Serum (makes your pores much smaller and helps keep dirt from getting into them. Eventually I had no more blackheads on my nose). So, I went to Ulta and bought the Murad 30-Day Acne Starter kit. Murad was founded by a skincare doctor - Dr. Howard Murad. He is a board certified dermatologist, a trained pharmacist and also acts as an Associate Clinical Professor of Medicine at UCLA. He is known as the "Father of Internal Skin Care" for his work and research promoting the use of vitamins and supplements, such as Alpha Hydroxy Acids, to help people achieve better skin. Now you can see why I was so willing to try the products! The Murad kit is reasonably priced for a starter kit ($34 at Ulta and on Murad's website, $30 on Amazon). I very much enjoy the way Murad sets up their products, because they make it super easy to figure out what you need. Each of the 11 product lines that they carry is color coded based on what you are trying to achieve, and numbered based on the steps in skin care that you should be following to have the best results. 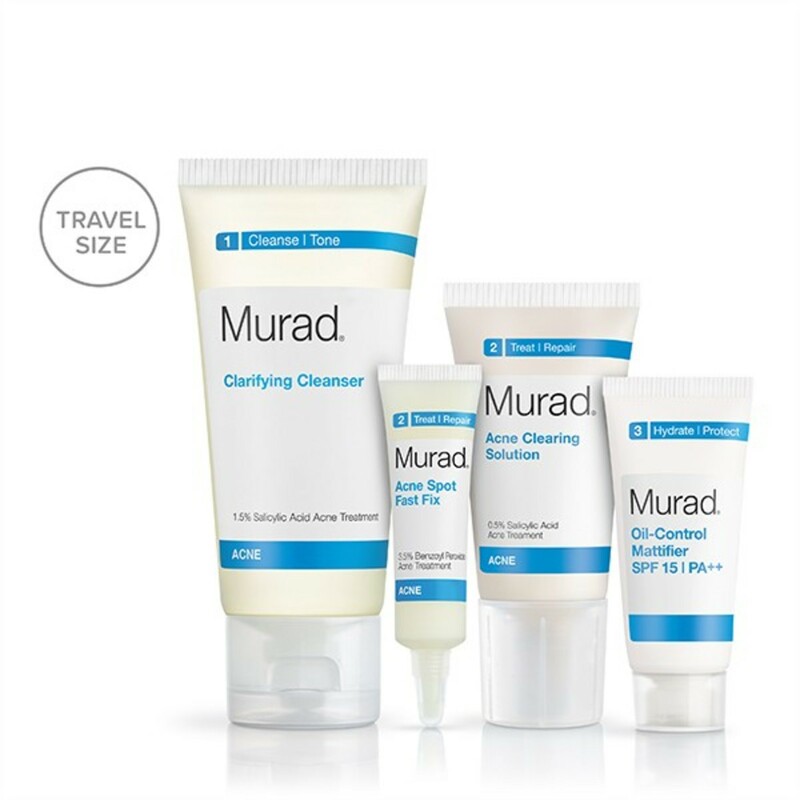 What's In the Murad 30-day Acne Starter Kit? The order of the products in the table is the order you should use them in. There are a few really great things about this kit. 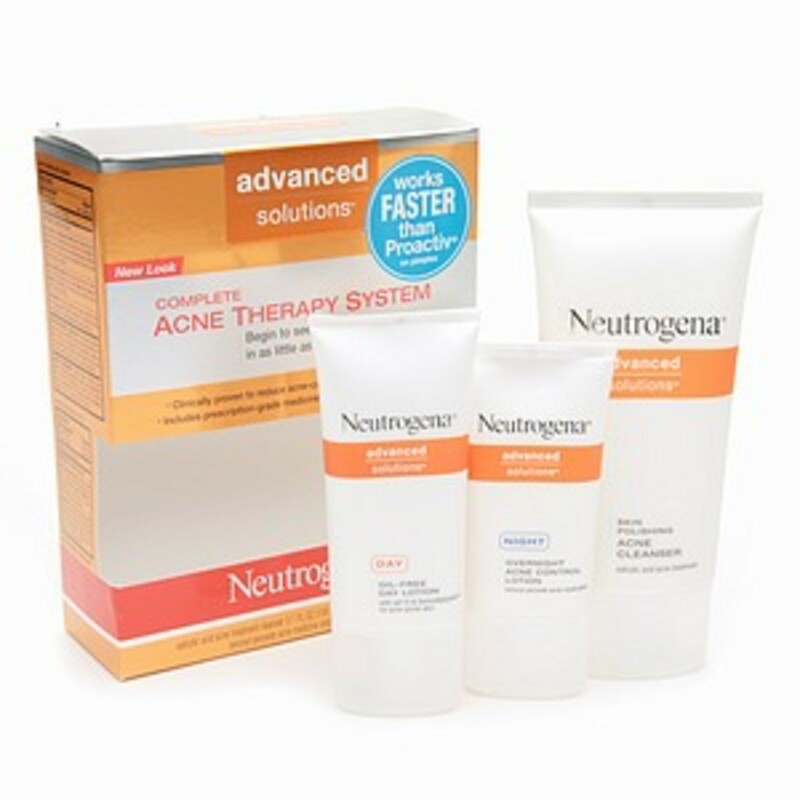 Each of the #1 and #2 products that come in the kit contain some form of acne treatment to help diminish breakouts. 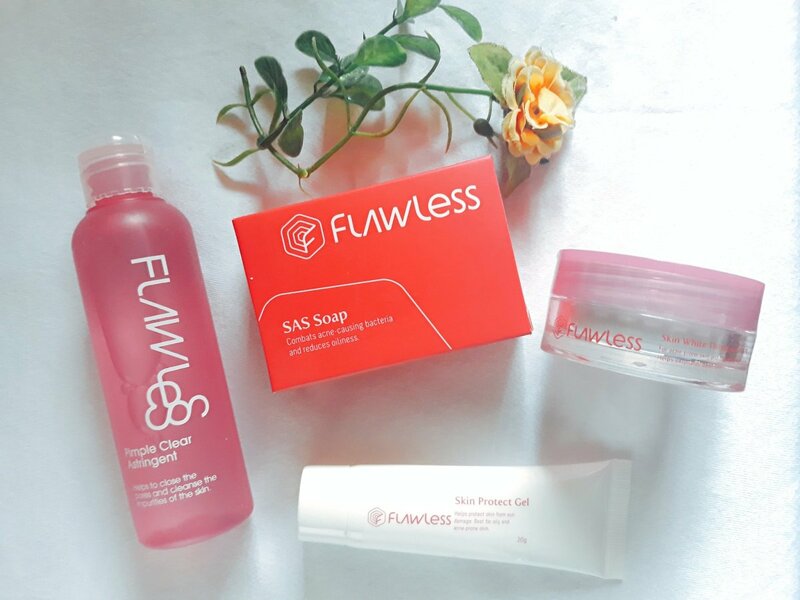 The Clarifying Cleanser contains 1.5% Salicylic Acid; Acne Clearing Solution contains .5% Salicylic Acid; and the Acne Spot Fast Fix contains 3.5% Benzoyl Peroxide. The Acne Spot Fast Fix contains Great Burnet (a perennial herb in the rose family) and Allantoin (a chemical compound) to soothe inflamed skin. 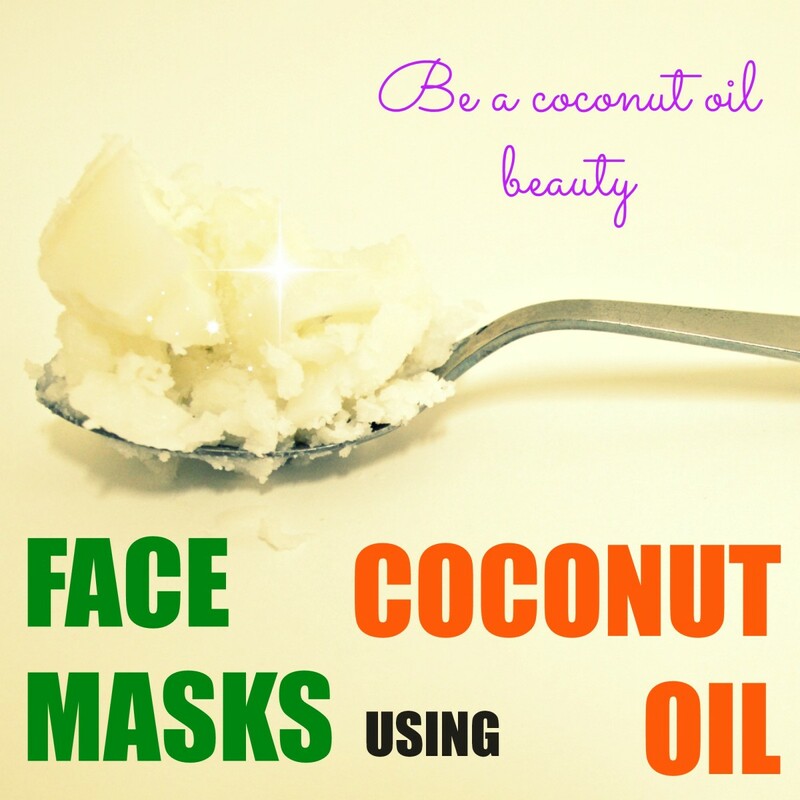 It also contains Niacinamide (a water soluble vitamin) to help restore an even skin tone. The Oil Control Mattifier is SPF 15 and absorbs super quickly into the skin. All of the bottles are travel friendly, AKA small enough to not be taken by the TSA at security checkpoints. The directions indicate that you should use the products morning and night, but in an effort to conserve the product since I was on a tight budget at the time, I only used them once a day. I think if I had done everything twice a day, I would have run out of product in around 20 days. By only using it once per day (in the mornings) I was able to stretch the product out to about 38 days before I had to replace. The first thing I ran out of was the Moisturizer, and the last thing the Acne Spot Fast Fix (60 days later I'm still actually on the first bottle). I started seeing a difference after just a few days of using the products. My acne was not gone by any means -- but a lot of my bigger spots on my cheeks started to fade, and I could see the spots on my chin beginning to get smaller. By the 35 day mark, the spots on my chin had completely disappeared, and I only had some recurring spots on my cheeks where I was getting some giant zits. In the end, I decided to go with another (slightly different) acne kit that came with slightly larger versions of each product plus an additional moisturizing agent. This one is called the Murad Complete Acne Control Kit. It costs $65 at Ulta and the Murad website, and is not available on Amazon. It again comes with blue labels and the same 3 steps. 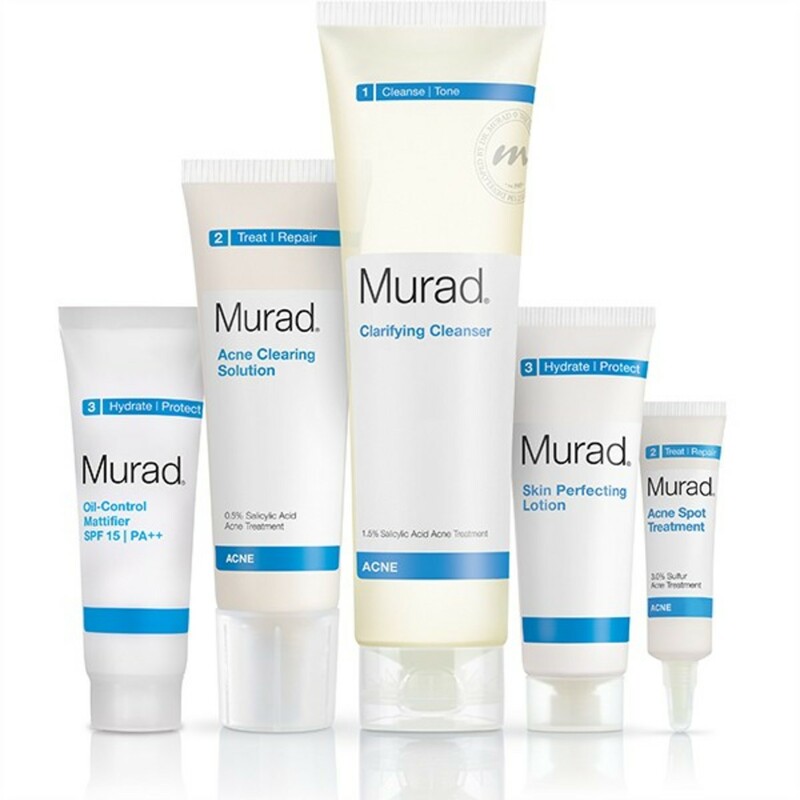 What's in the Murad Complete Acne Control Kit? If you shop at Ulta, sign up for a rewards card. You get 1 point for every dollar you spend on a normal basis. There are opportunities to get more points though: Buy your makeup during your birthday month so that you get 2x the points on everything. Watch out for 2x, 3x, & 5x point sales that they send out via email. . And if you want free stuff in addition to points, try to wait to buy new products until you see free gifts attached to them on the website. Once you spend $450 in a calendar year, you get platinum membership. Your points don't expire and the point rate per dollar increases to 1.25 so you earn points faster. Because of my points, I actually ended up not having to pay for the kit at all, AND I shopped at a time where there were tons of free gifts. When I bought my second kit replenished some of my makeup also, and ended up walking out of there with over $200 worth of product for about $50!! This kit comes with 2 moisturizers. At first, I thought, "Okay, I can just switch them out every other day, I don't have to use both!" But, after researching it and using the products that way for a few days, I realized that was not the way to do it. The Skin Perfecting Lotion is awesome and I like how smooth it makes my skin feel. It contains Retinol and queen of meadow extract, which help reduce oil production as well as toning and tightening pores. The problem is that it doesn't contain an SPF, and when used alone, the ingredients leave your face looking a little shiny (but not oily --- just shiny). That's where the Oil Control Mattifier comes in. It's got the SPF 15 and eliminates the shine given by the skin perfecting lotion. So, as I've indicated in the table, make sure you use all 5 products, and make sure you are waiting a minute or so in between the application of each product to allow your skin to absorb each product. After using many products to try and get rid of my breakouts, I found that Murad works best for my skin. 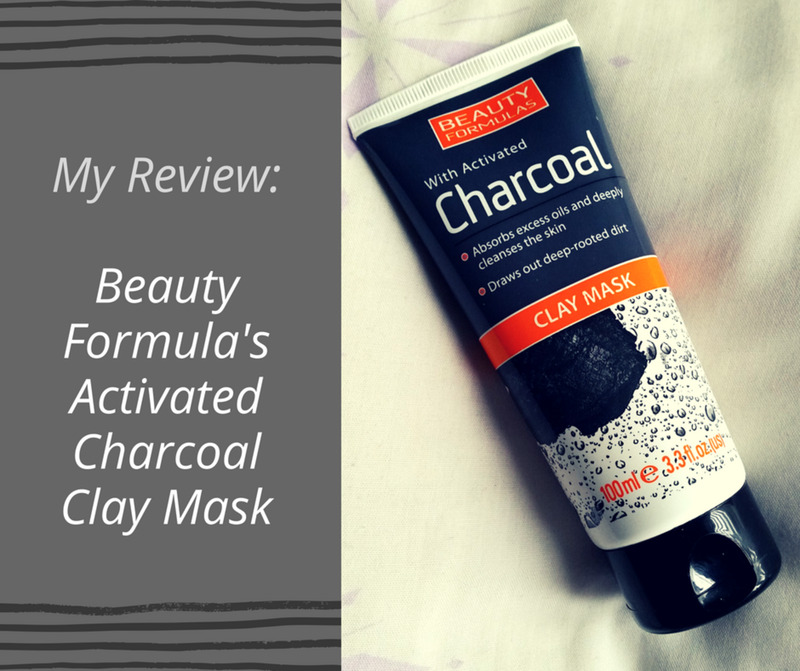 The brand has a trustworthy background in skincare and I've had really great results with it. It has evened out my skin tone and actually also helped with the redness that I get in the corners of my nose that aren't related to acne. 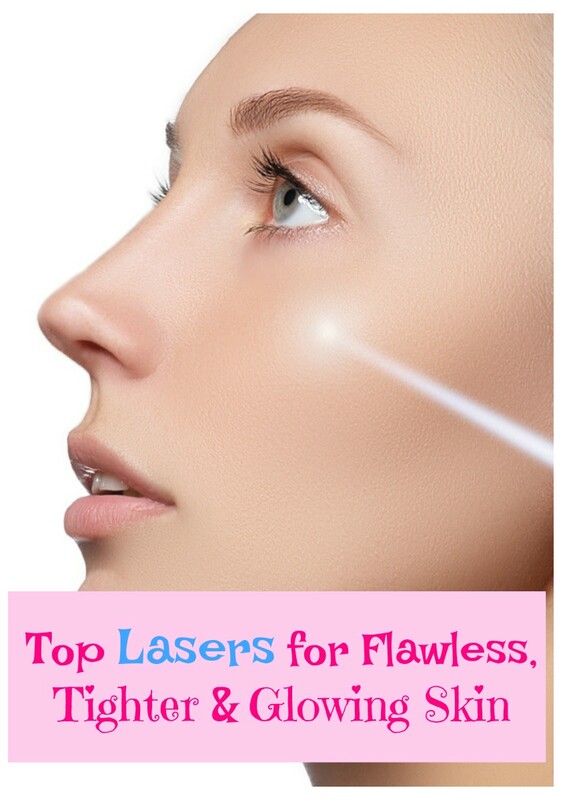 There's only a few cons -- the first one is that nobody is immune to getting a giant zit every once in a while, so those will happen even with this product. The plus side to that is that the products get rid of acne that has been around on your face for a long time, and it does it in a way that makes sure your skin doesn't get dried out. The second con is that my skincare routine in the morning now takes about 15 minutes due to having to let each product absorb into my skin before applying the next one, and also that it can be tedious to have to use so many products. I fixed this con by waking up 15 minutes earlier to get it done, because the fact of the matter is if you want your skin to clear up you need to put in the effort even if it's a little inconvenient. Overall, this product for me is a 10/10 would recommend to everyone to at least try it! 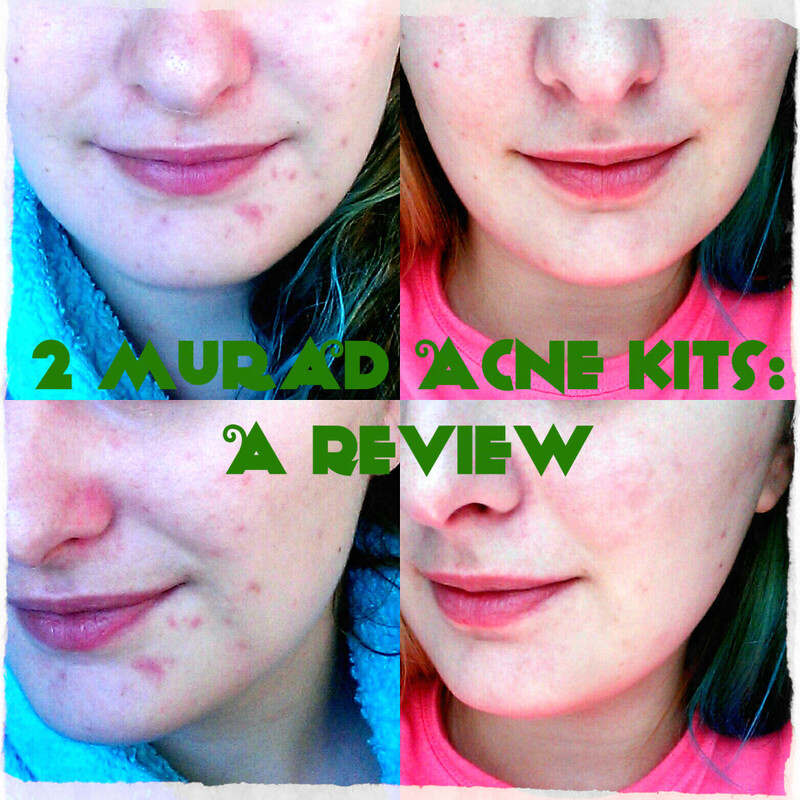 The Starter kit is a great way to test the products without breaking the bank and the Complete Acne Control kit is a really great upgrade if you decide you want to move further with the Murad Acne Skin Care Regimen. Should I still use Murad acne treatments after my face clears up? After your acne is gone, I still recommend using the clarifying cleanser and the mattifier every day. You can reserve the acne solution and the spot fix for when you get a breakout. Murad actually sells a smaller kit with just the mattifier and the clarifying cleanser in it, so that you don't have to buy the bigger kit unless you need it.